Turkish President claims United States and Israel are interfering in Iran's internal affairs. Turkish President Recep Tayyip Erdogan on Friday accused the United States and Israel of meddling in Iran, after a week of protests in the Islamic Republic. "We cannot accept that some countries – foremost the U.S., Israel – to interfere in the internal affairs of Iran and Pakistan," Erdogan told reporters before heading on a trip to France, according to AFP. "It is turning the people against each other in these countries. It's a shame that we have seen this done in many nations... We saw this in Iraq," he added. Erdogan did not expand on the nature of the alleged meddling in Pakistan but on Thursday the U.S. announced a freeze in deliveries of military equipment and security funding until Pakistan cracks down on the militants. 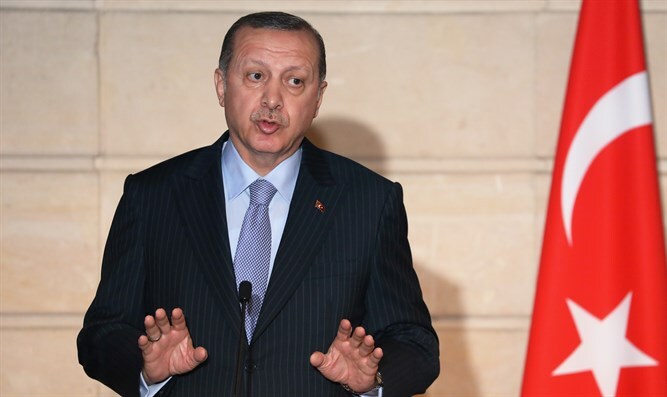 The Turkish president then referred to problems in "Syria, Palestine, Egypt, Libya and Tunisia" and in African countries including Sudan and Chad. He claimed a "game was being played" in certain countries, which he noted were all Muslim-majority nations. "They are taking steps towards making the plentiful underground riches in all these countries their own resources," charged the Turkish leader. "Sorry, these realities should be known by our people and all people," he said. Despite the agreement, Erdogan has upped his anti-Israel rhetoric in recent weeks, after U.S. President Donald Trump recognized Jerusalem as Israel’s capital. Erdogan said he would fight against Trump’s controversial declaration, describing Israel as a "terrorist state" that kills children. "Palestine is an innocent victim... As for Israel, it is a terrorist state, yes, terrorist!" Erdogan said in a speech in the central Turkish city of Sivas last month. Soon after Trump made his announcement, an adviser to Erdogan said the country intends to sever its diplomatic relations with Israel in response to Trump’s declaration, which he called "aggression against Palestinian rights and complicity with the crime of the occupation." While Erdogan has on occasion criticized Iran's "Persian imperialism" in the Middle East amid bouts of tension in the Turkey-Iran relationship, relations between Ankara and Tehran have warmed since the two countries worked closely with Russia in the last few months to bring peace to Syria.